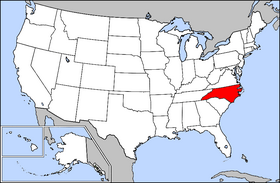 North Carolina is a Southern state in the United States. North Carolina is one of the thirteen colonies that revolted against British rule in the American Revolution. It is bordered by South Carolina on the south, Georgia on the southwest, Tennessee on the west, Virginia on the north, and the Atlantic Ocean on the east. The USS North Carolina was named in honor of this state. The State of North Carolina is included between the parallels 34° and 36°30' north latitude, and between the meridians 75°30' and 84°30' west longitude. 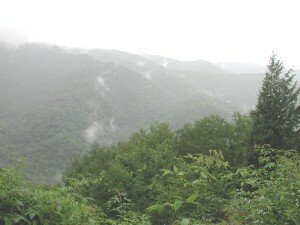 Its western boundary is the crest of the Smoky Mountains, which, with the Blue Ridge, forms a part of the great Appalachian system, extending almost from the mouth of the Saint Lawrence River to the Gulf of Mexico; its eastern is the Atlantic Ocean. Its mean breadth from north to south is about one hundred miles (160 km); its extreme breadth is one hundred and eighty-eight miles (303 km). The extreme length of the State from east to west is five hundred miles (800 km). The area embraced within its boundaries is fifty-two thousand two hundred and eighty-six square miles (135,000 km²). Major geographic features include the Blue Ridge Mountains in the west, the Piedmont region of the central portion of the state, the Coastal Plain, and Cape Fear, Cape Hatteras, and the Outer Banks off the eastern coast. These regions are roughly divided by their elevation, with the Coastal Plain extending to areas below 400 feet above sea level; the Piedmont encompassing those areas between 400 and 1,500 feet; and the Mountain region referring to areas from 1,500 feet to the highest Appalachian peaks at more than 6,600 feet. North Carolina was originally inhabited by a number of native tribes, including the Cherokee, Creek, Tuscarora, Lumbee, and Catawba. North Carolina was the first American territory the English attempted to colonize. Sir Walter Raleigh, for whom the state capital is named, chartered two colonies on the North Carolina coast in the late 1580s, both ending in failure. The demise of one, the "Lost Colony" of Roanoke Island, remains one of the great mysteries of American history. Virginia Dare, the first English child to be born stateside, was born in North Carolina. Dare County is named for her. 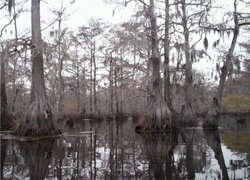 By the late seventeenth century, several permanent settlements had taken hold in the Carolina territory, which encompassed present-day South Carolina and Tennessee as well. In 1712, North Carolina became a separate colony. It reverted to a royal colony seventeen years later. In April 1776, the colony became the first to instruct its delegates to the Continental Congress to vote for independence from the British crown. On November 21, 1789, North Carolina ratified the Constitution to become the twelfth state in the Union. Between the American Revolutionary War and the American Civil War, North Carolina worked to establish its state and local governments. In 1840, it completed the state capitol building in Raleigh, still standing today. In mid-century the state's rural and commercial areas were further connected by construction of a 129 mile (208 km) wooden plank road, known as a "farmer's railroad," from Fayetteville in the east to Bethania (northwest of Winston-Salem). In 1860 North Carolina was a slave state, however according to the Museum of Cape Fear, it was only two percent of the population that owned over 99 percent of the slaves in the state. There were also about 30,000 free blacks residing in the state. Somewhat divided on whether to support the North or the South in the Civil War, North Carolina was the last state to secede from the Union in 1861. Governor Ellis, leader of the state at the war's beginning in 1861, famously declared in response to President Lincoln's call for 75,000 troops to suppress the "rebellion" that "you can get no troops from North Carolina." However, under his leadership and that of his successor, Governor Zebulon Baird Vance of Asheville, elected in 1862, the Tar Heel State did provide 125,000 troops to the Confederacy, more than any other Confederate state. Approximately 40,000 of those troops never returned home, dead of battlefield wounds, disease and privation. Although few major engagements took place in North Carolina itself, her troops served in virtually all the major battles of the Army of Northern Virginia. The largest battle that occurred in North Carolina was at Bentonville, a futile attempt by Confederate Gen. Joseph Johnston to slow Union Gen. Sherman's advance into the Carolinas in the spring of 1865. Gen. Johnston surrendered one of the largest Confederate armies near Durham in late April 1865, weeks after Gen. Robert E. Lee's surrender at Appomattox, but the final surrender in North Carolina came at Waynesville in Western North Carolina in May, when remnants of Thomas' Cherokee Legion laid down their arms. In modern times, Fort Bragg is located in North Carolina, near Fayetteville; it is one of the largest and most comprehensive military bases in the United States and is headquarters of the U.S. Army Special Operations Command. Over the past century, North Carolina has grown to become a national leader in agriculture, financial services, and industry. The state's industrial output—mainly textiles, chemicals, electrical equipment, paper and paper products—ranked eighth in the nation in the early 1990s. Tobacco, one of North Carolina's earliest sources of revenue, remains vital to the local economy. Recently, technology, research, and banking has become a driving force in the state, especially with the creation of the Research Triangle Park between Raleigh and Durham in the 1950's, along with Charlotte's newfound international status as the second largest banking center in the entire United States. The state is also a center of American motorsports with many NASCAR racing teams and related industries located near Charlotte. 1776: This one was ratified December 18, 1776, as the first constitution of the independent state. The Declaration of Rights was ratified the preceding day. 1868: This was framed in accordance with the Reconstruction Acts after North Carolina was readmitted into the Union. It was a major reorganization and modification of the original into fourteen articles. It also introduced townships which each county was required to create, the only Southern state to do so. 1971: This is a minor consolidation of the 1868 constitution and subsequent amendments. The capital of North Carolina is Raleigh, though the largest city is Charlotte. North Carolina's governor is Mike Easley, a Democrat. Its two U.S. senators are Elizabeth Dole and Richard Burr, both Republicans. The governor, lieutenant governor, and eight elected department heads form the North Carolina Council of State; Ten other department heads appointed by the Governor form the North Carolina Cabinet. The state's current governor is Democrat Mike Easley. The North Carolina General Assembly consists of two houses, a 50-member Senate and a 120-member House of Representatives. For the 2005–2006 session, the current President Pro Tempore of the Senate is Democrat Marc Basnight (the Lieutenant Governor of North Carolina is the President of the Senate); The House Speaker is Democrat James B. Black. The prior term's power sharing Co-Speaker arrangement is no longer in effect, as the House Democrats won a decided victory and majority of the seats in the 2004 election. The Supreme Court of North Carolina is the state's highest appellate court; it numbers seven justices. the North Carolina Court of Appeals is the only intermediate appellate court in the state; it consists of fifteen judges who rule in rotating panels of three. Together, the Supreme Court and Court of Appeals constitute the Appellate division of the court system. The Trial division includes the Superior Court and the District Court. All felony criminal cases, civil cases involving more than $10,000 and misdemeanor and infraction appeals from District Court are tried in Superior Court. A jury of 12 hears the criminal cases. In the civil cases, juries are often waived. Civil cases such as divorce, custody, child support and cases involving less than $10,000 are heard in District Court, along with criminal cases involving misdemeanors and infractions. The trial of a criminal case in District Court is always without a jury. The District Court also hears juvenile cases involving children under the age of 16 who are delinquent and children under the age of 18 who are undisciplined, dependent, neglected or abused. Magistrates accept guilty pleas for minor misdemeanors, accept guilty pleas for traffic violations and accept waivers of trial for worthless-check cases among other things. In civil cases, the magistrate is authorized to try small claims involving up to $4,000 including landlord eviction cases. According to the Bureau of Economic Analysis, the state's 2003 total gross state product was $314 billion. Its 2003 Per Capita Personal Income was $28,071, 38th in the nation. North Carolina's agricultural outputs are poultry and eggs, tobacco, hogs, milk, nursery stock, cattle, and soybeans. Its industrial outputs are tobacco products, textile goods, chemical products, electric equipment, machinery, and tourism. Charlotte, the largest city in the state, is also the nation's largest banking presence outside of New York City. North Carolina is also the largest film making state outside of California. Movie Studios are located in Shelby, Raleigh-Durham, Charlotte, and the most popular, EUE Screen Gems Studios in Wilmington. Some of the film/telelvision credits filmed there include: Dawson's Creek, One Tree Hill, Cape Fear, Maximum Overdrive, and The Crow. According to the U.S. Census Bureau, as of 2004, North Carolina's population was 8,541,221. The five largest ancestry groups in North Carolina are: African American (21.6%), American (13.9%), English (9.5%), German (9.5%), Irish (7.4%). It is probable that most of those claiming "American" descent are descended from the early Scots-Irish settlers who settled primarily in the Piedmont and the mountains. African-Americans are concentrated in the state's eastern Coastal Plain and in parts of the Piedmont Plateau where plantation agriculture was most dominant. Until the mid 1860s, North Carolina had more small farms and fewer plantations than adjacent South Carolina and Virginia. These farmers were called "Yeoman" farmers who were non-slave owning, private land owners of tracts of aproximately 500 acres. North Carolinians of British ancestry are concentrated in the western mountains, coastal areas, and Piedmont areas. Residents who claim American descent are most prevalent in the rural areas of the central Piedmont and most of the mountains. The tri-racial Lumbee Indians, who claim descent from the Lost Colony survivors, live primarily in Robeson county, and the Cherokee Indians live in western Swain county. The state has one of the fastest growing Latino and Asian populations in the country; these populations have nearly quintupled and tripled respectively between 1990 and 2002. 6.7% of North Carolina's population were reported as under 5, 24.4% under 18, and 12.0% were 65 or older. Females made up approximately 51% of the population. These Community Websites are part of a network of over 33,000 represented within the Hometown USA Network of Communities. We rely upon and encourage all members of the community to participate in the development of these pages. So come on in and visit with us, see what our great communities have to offer and if you can't find what you are looking for, let us know by posting a question in our Community Forums so that a member of that hometown can reply to you or email you the answer. A self storage directory, like Self Storage Finders, can help you locate a storage unit to fit your needs.